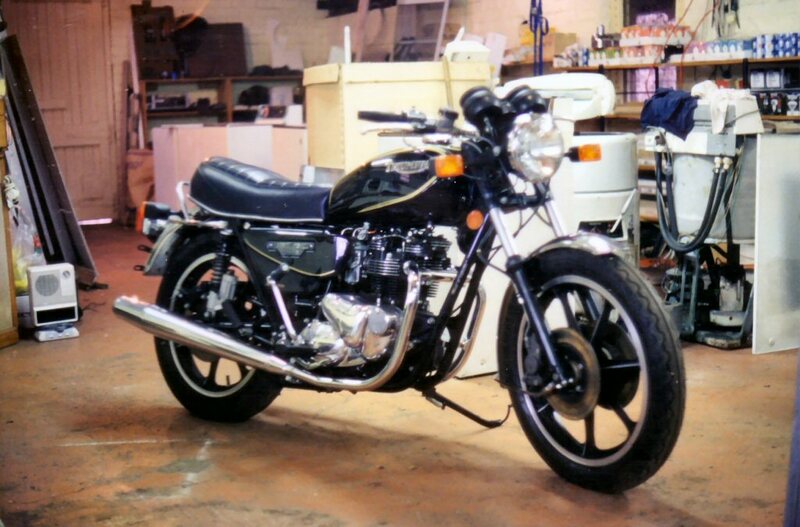 This was the second of the two bikes bought in conjunction with a friend. From memory we paid NZ$11000 each for the benefit of owning two brand new examples of bikes whose manufacturer was now either gone forever, or stumbling on in an erratic fashion - depending on which camp you were in. However, this example was totally new to me. I had never even seen a photo of such a model. 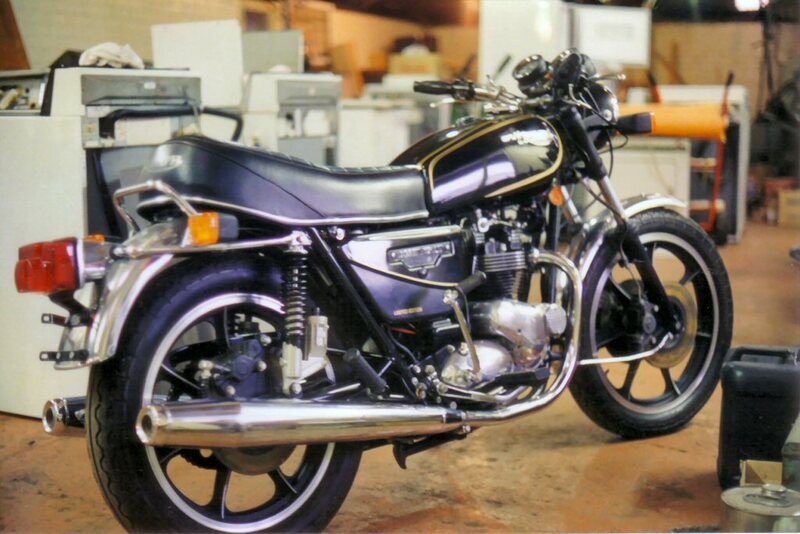 I had seen a bike called a Royal Wedding Special at Earls Court bike show in 1980. It had a nickel frame, chrome tank and king and queen seat. I thought it was the most hideous Triumph I had ever set eyes on. I was quite shocked as to whom might have thought that such a bike would be deemed desirable. Strange business. When this bike showed up I was very impressed. Black and gold nicely understated, alloy wheels and even twin disk front end, Bing carbs and rubber mounted footpegs, Marzocchi rear shocks, electric start, TSS crankshaft - the list of "goodies" went on and on. Perhaps best of all, the exhausts were finally given an uplift, which managed to convey a more modern fluid appearance and take the eye from the ancient perpendicular engine. 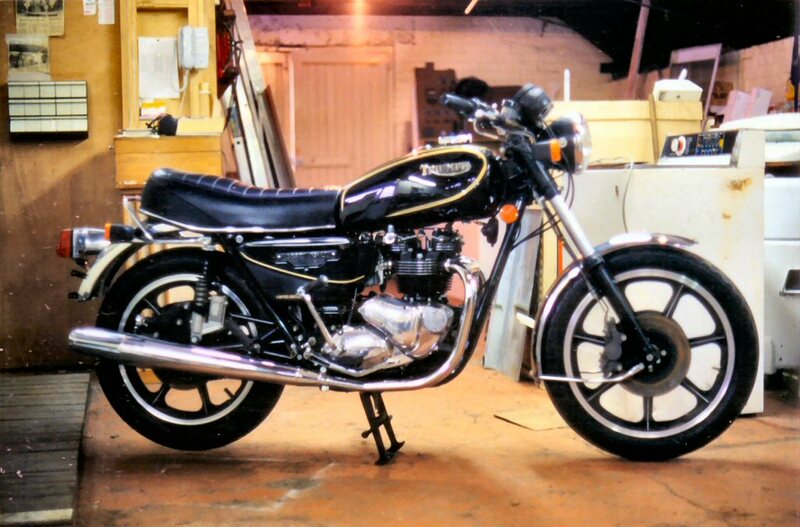 Of all the Triumph twins I had seen, this was light years ahead of the usual, and had the potential to be one very slick 750. Thus began a brief love affair. 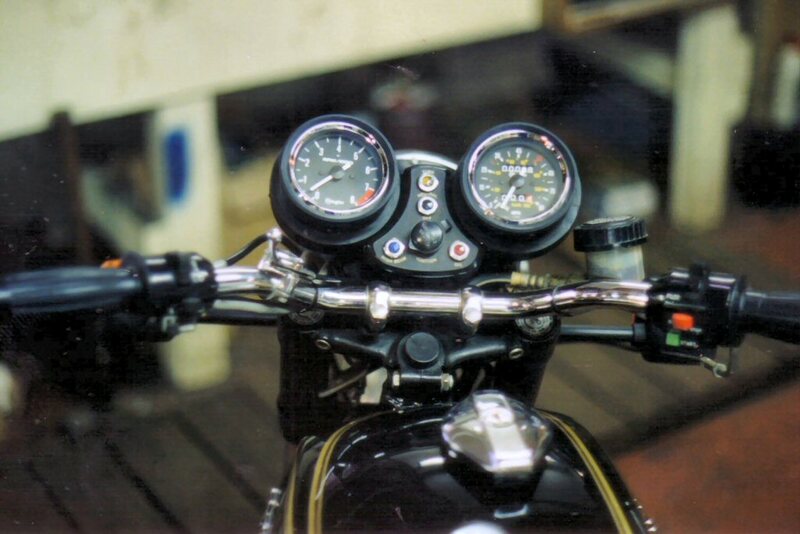 Although hardly one for the purists, this was a limited production item and had the potential to be both a rewarding riding experience and a rapidly appreciating machine - provided one could get parts to maintain it. Making enquiries to that end I was somewhat disappointed with the response I received from the people who were at best local "Agents" in the day. If we had been on the internet back then things may have looked different, but things took a long time to reach the "Colonies" back then. I place a lot of importance on aesthetics, and I thought this bike looked "right". I had no interest in the lip service it paid to what turned out to be an ill-fated wedding, but I could see it being a bike I would be proud to be seen on, if I could manage to swing it financially. That did not turn out in my favour. If I had settled for the bike I would have lost my investment fund for future bike projects, and I did not see much opportunity for replacing that fund by any other means than selling both of these bikes and taking on a "project" - albeit a project that would eventually repay me for the hours of labour it would take. That was the way the muffin disintegrated..